In Peru when you are still in your mom’s belly, your father has already decided which is going to be your favorite soccer team. Parents welcome you to the world with a little uniform of their team. That’s life in countries where Fútbol is the only passion. As the years went by, I discovered the exhilarating experience of sharing the passion for my soccer team with my friends, and even with strangers (whom you only met once a week at the stadium) when all together and sweaty, you embrace and jump and yell and sing until you lose your voice, raving for your team. When I came to live in New York I thought I was never going to able to find a sport like Fútbol. I went twice to the baseball Stadiums–once to the Yankees, once to the Mets. I enjoyed a Rangers game and even raved a little bit for the Devils, but hockey was not the same. Until something happened four years ago. It was a winter night and I was one of the many strangers in an Irish bar in the Bronx, watching in awe, with my mouth open, how the Giants defeated the unbeatable Patriots. That night, I felt electricity running in the marrow of my bones, touching all the nerves of my body when the Giants made it happen. I yelled, I jumped, I was so happy. Yesterday night I discovered myself jumping like a kid when Mario Manningham got that impossible ball. I jumped and yelled, full of joy, when our players managed to block the Patriots from getting that almost-perfect, last-minute ball. We are the champions my friend. Again. Yesterday night, watching that game, it felt as good as I when I was a kid, jumping in that Estadio Nacional de Lima. I never considered myself a football fan. 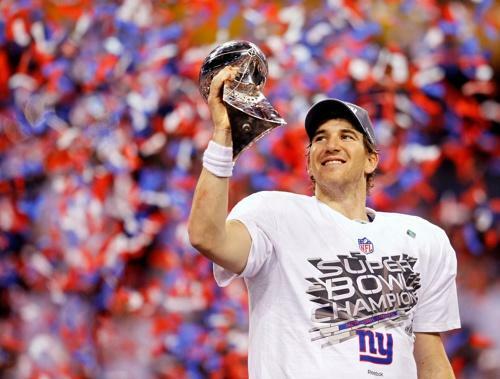 But maybe I am becoming one: a New York Giants Fan.